Ashley Fiona creates ashkeepers that can be used in personal rituals. 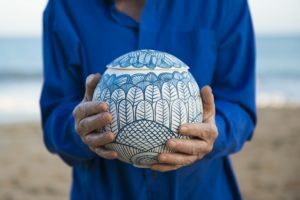 NSW ceramicist Ashley Fiona is one of 82 artists who have entered Palliative Care Australia’s Life in Death art competition. See the full range of entries here and cast your vote for the People’s Choice award. It was the death of her grandfather that inspired Ashley Fiona to create her first porcelain ashkeeper, four years ago. Having not long finished her ceramics training, she wanted to create something beautiful for her Nan to keep his ashes in. She thought an ashkeeper might also help her Nan’s healing. Ashley Fiona’s art competition entry is a photograph of the first ashkeeper she sold. It remains her favourite piece. The healing process is something Ashley, 29, has long understood, having lost her mother when she was just thirteen. “I don’t think that I would have had the idea for the ashkeeper had mum not died when I was so young,” says Ashley. “Her death defined me for a very, very long time. It was really all anyone ever needed to know about me. “It has been a big process; to heal my own grief and loss. It’s not something you get over. You just learn to incorporate it into your daily life. The youngest of three girls, Ashley says at the time of her mother’s death, she and her sisters didn’t know anyone else who had lost an immediate family member. With no-one to relate to, Ashley found the years afterwards a hard and lonely time. “It was one of those things you think is never going to happen to you and then it does. You have no blueprint to even begin the process of trying to heal from such a massive loss so early on. She remembers her mother’s ashes being kept in an ugly plastic box that “was unsightly and unrefined which is everything my mother wasn’t”. The box was stored insider her father’s bedside cupboard for a while, where the girls never looked at it, and then her mother’s ashes were scattered in the ocean. 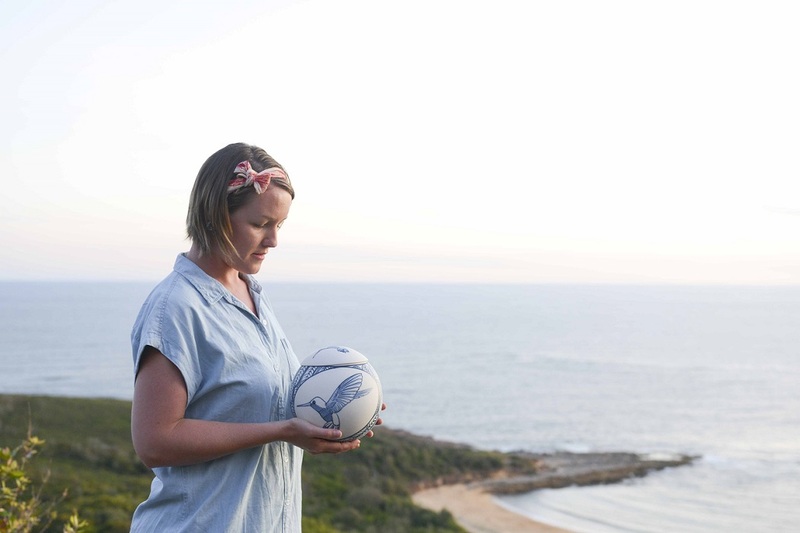 For Ashley and her sisters as teenagers, there was a keen sense of loss in not having a place where they could place special items, light a candle and remember their mum. That experience suggests in part why Ashley’s fine, spherical vessels offer more than aesthetic and tactile beauty. The lid inverts to become a candle holder, so the ashkeeper can be used in personal rituals. Ashley believes rituals are an important part of the healing process, enabling a sense of connection with a loved one, despite them not being there. “It was very important that the ashkeeper was interactive, as opposed to something you just put away in a cupboard, where you don’t look at it and there’s a type of fear attached to what’s inside,” says Ashley, who started creating them to order for families last year. “Just because your loved one is physically not here doesn’t mean your relationship with them ends. It changes. 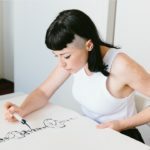 Ashley hand paints each piece she creates, ensuring they are all different and patterned appropriately for each person they come to represent. The spherical form however is consistent, as it represents the cyclical nature of life and death. Each piece requires two firing processes and a long, meticulous drying process, so they take Ashley several weeks to make. She has refined the design over time, having made an initial ashkeeper for her grandfather that was too small. The ashkeeper she eventually presented her Nan was extra-large, to ensure her Nan’s ashes would fit in there as well. “She wants to her ashes to go in the ashkeeper with my grandfather’s and then we can scatter them as one, so they will be together eternally which I think is beautiful and romantic. Like her mother, her grandparents’ want their ashes to eventually be scattered in the ocean; something Ashley would like for her own ashes too. She and her sisters recently found a way to keep a sense of their mother close to them. This year, on what would have been her sixtieth birthday, the sisters visited the beach where their mother’s ashes were scattered. They collected some sand and transferred it into three vials, which each of them now wear as a pendant on a necklace. “It is usually the first thing I put on when I come into the studio, because it very much helps me centre and go into my heart space,” Ashley says. Wow what an amazing and realist view of life and death. Great article and thank you Ashley for sharing your experience on this very sensitive issue in such a practical manner. I wish you well. I love the idea of sand in a pendant for those who don't want to put ashes in a pendant to remember their loved ones.